She's finally ready. You've spent years waiting to teach your little the secret art of ninjutsu and now is the time. We know...we know. 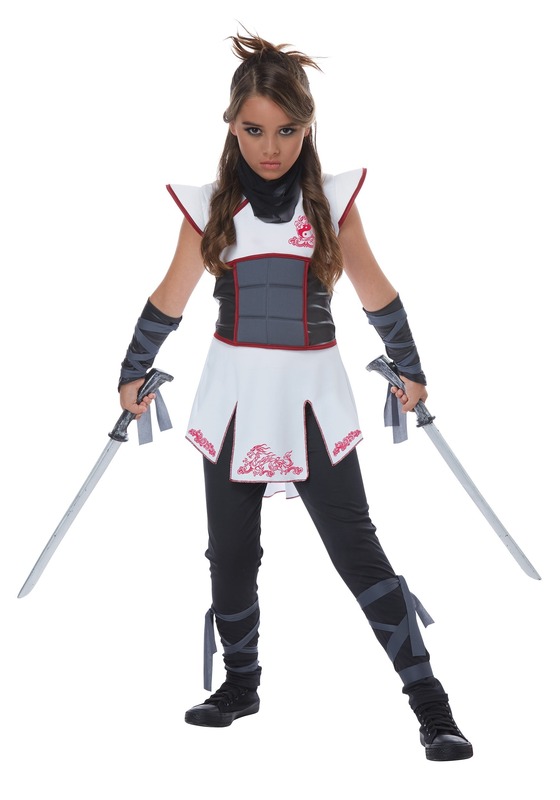 You want to teach her your patented Mega Dragon Ultra Lightning Punch, but before you teach her your signature ninja moves, you'll need to get her the appropriate shinobi gear. After all, how many deadly ninjas have you ever seen wearing a pair of denim capri pants while they sneak through the night? That's right, none. Your little girl is going to need full-on stealth gear that helps her feel like a silent warrior, and we just so happen to have the perfect outfit for her. 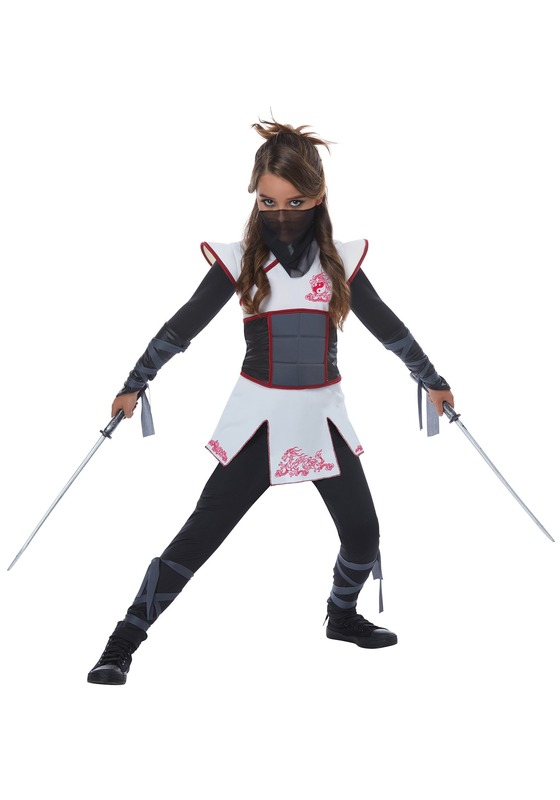 This Ninja costume for girls comes with everything your child could need to begin her new foray into the world of ninja! The white top features padded “armor” pieces around the waist and pointed shoulders for a style that will strike fear into her opponents. Vibrant red dragon emblems on the chest and along the skirt will make sure that all of her enemies know that she's a true shinobi master. 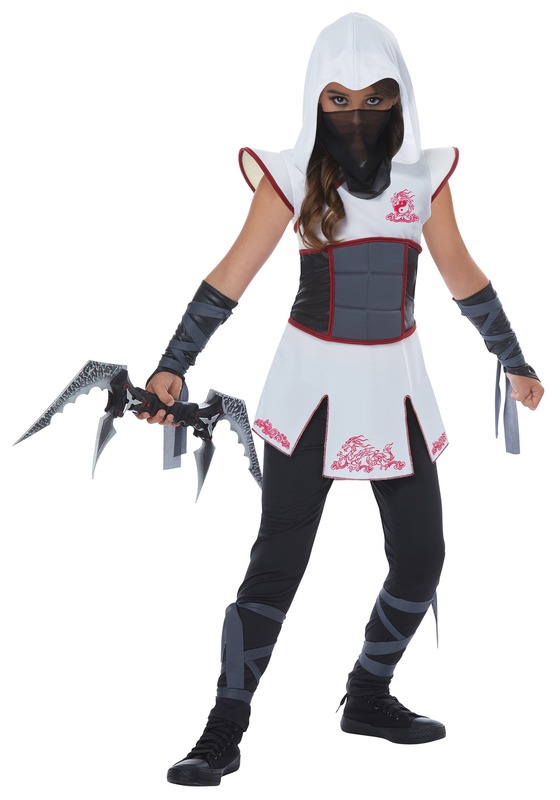 A white hood helps conceal her identity during intense covert operations, while wrist ties and leg ties add that authentic ninja-tastic look to the outfit. Once she has it on, she'll be ready to master every technique that she can learn. Be sure to add some of our toy ninja weapons to your order! They make for a perfect way to practice sword and shuriken skills before you send her off to real mission.